Sabatini’s Pizza, Monk’s Pub and Holy Grale Become Next On-Premise Accounts to be Granted Governorship After Meeting High Standard of Excellence. North America (October 16, 2017) – Trappist Brewery Koningshoeven, better known as La Trappe, has awarded the next three U.S. Governorships to Sabatini’s Pizza of Exeter, Pennsylvania, Monk’s Pub of Chicago, Illinois and Holy Grale of Louisville, Kentucky. 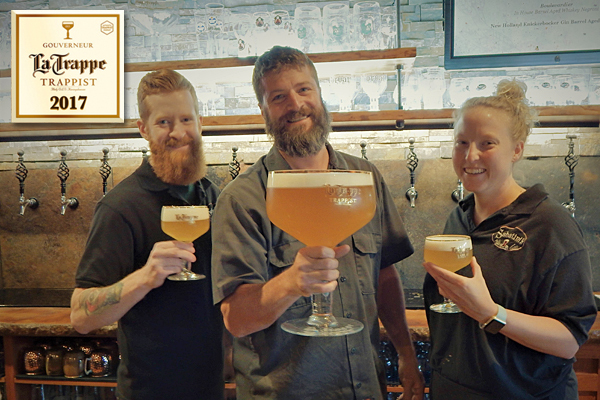 The La Trappe Governorship program was launched in 2016 and was established to recognize restaurants and bars in Europe that have made extraordinary efforts to sell, support and promote La Trappe products and other Trappist beers. For 2017, the program has been expanded to the U.S. after a successful first year in Europe. Sabatini’s Pizza, which operates both a restaurant / bar and a bottle shop in an adjacent space, will celebrate its Governorship in both buildings on Wednesday, October 18. Sabatini’s will tap at least eight La Trappe offerings along with numerous other rare and delicious Trappist brews including Chimay Red and Blue, Stift Engelsel Benno and Gregorious. Being awarded a Governorship is no small feat, and candidates are held to rigorous standards to ensure their values align with the high standards associated with producing Trappist ale. The owners of newly minted Governor Holy Grale spent time visiting the La Trappe monastery in Tilburg, Netherlands, helping them to develop their admiration for the brewery’s legacy and values. For interview opportunities with the La Trappe Governors or for more information about Trappist Brewery Koningshoeven “La Trappe” and its world-renowned Trappist ales, please contact Lanny Hoff at +1 (612) 245-5433 or by email at lanny.hoff@artisanalimports.com.